What is the process for submitting transcripts? Verification: there are different verification types; “Full Verification”, “Light Verification” or “No Verification” depending on how the school configured their program requirements. 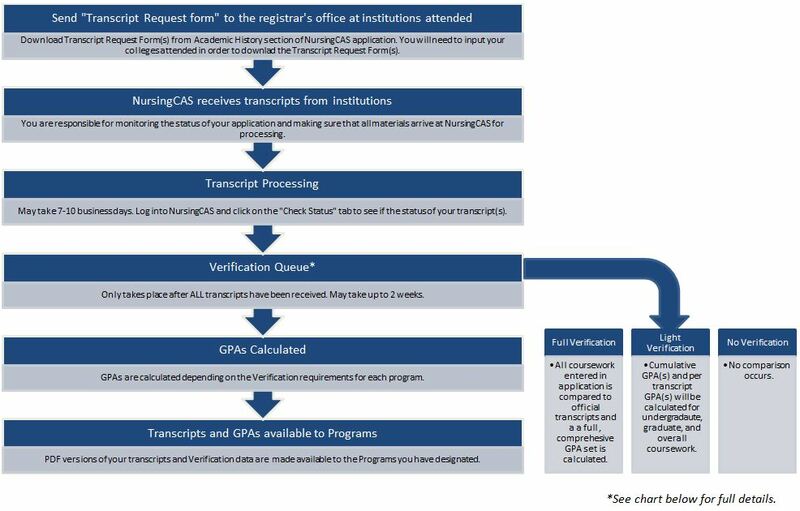 You can determine which type of verification your program has in the Academic History section by viewing the transcript requirements and transcript entry requirements. See images below for more details. When you navigate to the Colleges Attended tab under the Academic History section of your application you will be able to view the transcript requirements for each program you are applying to. After you enter the schools you attended previously, you will see a blue button that will allow you to download a Transcript Request form. You can then send that form to each school you attended in the past. They will then send an official transcript to NursingCAS. Official Transcripts – Your program requires that you have official transcripts mailed directly to NursingCAS by the issuing institution’s registrar’s office for processing where they will be validated for authenticity by the operations team at NursingCAS. Transcripts should be mailed to the address below (and please have the registrar include the Transcript Request Form). Please note: NursingCAS accepts official transcripts sent electronically from Credentials Solutions, Parchment, and National Student Clearinghouse. See if your school participates with Credentials Solutions. See if your school participates with Parchment. See if your school participates with National Student Clearinghouse. Unofficial Transcripts: Your program does not require you to send any transcripts to NursingCAS. Instead please upload an unofficial version of your transcripts in either the Colleges Attended section or the Program Materials section under the Documents tab depending on what your school requires. 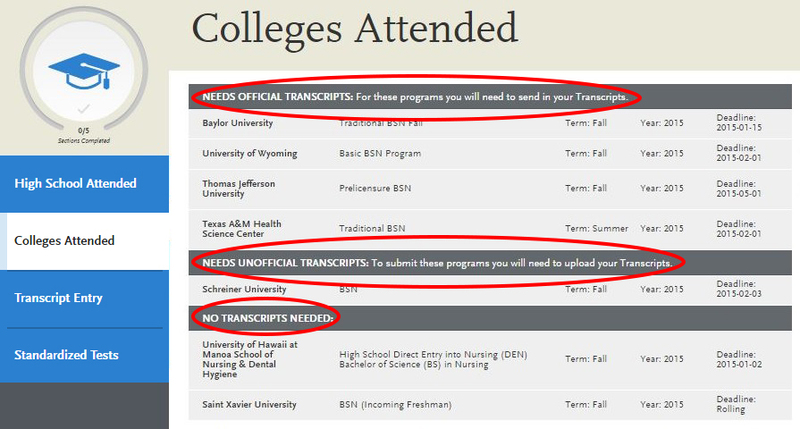 No Transcripts: The program you have selected does not require any transcripts be sent to NursingCAS. Please note that typically this option is chosen by schools that require the transcripts are mailed directly to their offices, please check with this program to determine additional transcript requirements outside of NursingCAS. Read the full instructions about Transcripts. 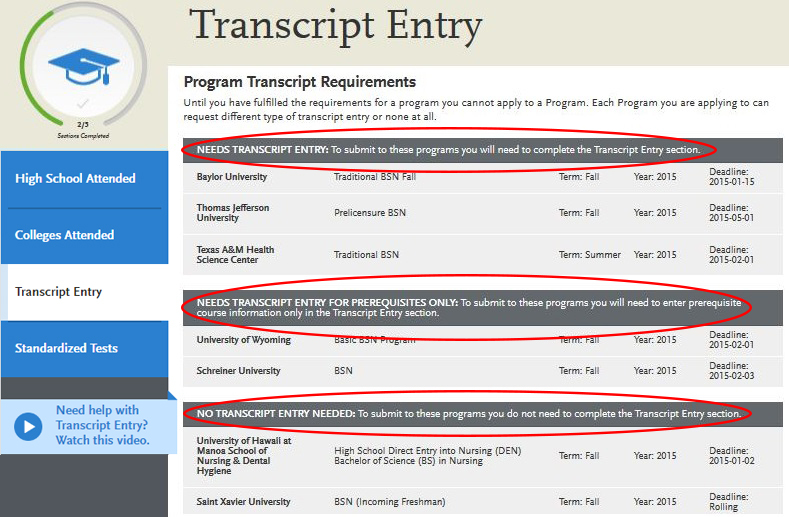 When you navigate to the Transcript Entry tab under the Academic History section of your application you will be able to view the requirements for each program you are applying to. Needs Full Transcript Entry – Applicants will enter in ALL of the course work they have completed at any college or university attended in order to submit. NursingCAS will verify this data for accuracy and calculate a number of GPAs for the programs you are submitting your application to, including GPA by year, GPA by subject, GPA by school, nursing GPA if applicable, and cumulative GPA. Needs Transcript Entry for Prerequisites Only – Applicants will ONLY enter specific courses they have completed to match a program’s prerequisite course work requirements. NursingCAS will calculate a limited number of GPAs for the programs you are submitting your application to, including a Per Transcript GPA(s) and an Overall GPA. Note: if any key data is missing from the transcripts, then a GPA may not be calculated. No Transcript Entry Needed – Applicants will NOT enter in any coursework data and there will be no GPAs provided to the program(s) you are submitting your application to if they do require unofficial or no transcripts to be submitted via NursingCAS. If the program(s) require official transcripts be submitted to NursingCAS, then Per Transcript GPA(s) and an Overall GPA will be provided to the program(s). Note: if any key data is missing from the transcripts, then a GPA may not be calculated. If you selected any programs that required prerequisite or full coursework entry you will need to input the following information and any program selections with coursework requirements. Read full instructions about transcript entry here. Why do I need to enter in my course work? In order to verify your course work to help schools make admissions decisions, this data must be entered into your application. Nursing and admissions staff review and evaluate hundreds of transcripts (depending on the size of applicant pool) when making admissions decisions. It can be difficult to evaluate applicant course work when different schools report it in different ways and transcripts vary in look. Typically schools do hand GPA calculations and the volume of applicants they review can lead to human error. The verification process helps to cut down on human error which benefits both applicants and nursing programs. NursingCAS realizes that transcript entry can be a time consuming process depending on the amount of course work information an applicant needs to enter. But please understand that taking the time to input this data will greatly help the admissions staff at the programs you are applying to by reducing the amount of GPAs they have to manually calculate per applicant. Entering coursework is a common expectation for students applying to health programs such as medicine, dentistry, physical therapy, pharmacy, public health, podiatry, veterinary, chiropractic, occupational therapy, physician’s assistant, audiology, communications sciences, optometry, health administration, and osteopathic medicine; all enter in their course work as part of the application process. *Using the P.O. Box address for anything mailed by FedEx/UPS may delay the receipt of your transcript in office and you may need to redirect where the transcript is mailed to. NursingCAS is not responsible for any delays caused by this as these services DO NOT deliver to P.O. Boxes. Please note that overnight mail MUST be delivered to NursingCAS during our hours of business, which are Monday – Friday, 9am – 5pm Eastern Standard Time. We cannot receive materials which arrive outside of these hours at our street address. NursingCAS accepts electronic transcripts from Credential Solutions, Parchment, and National Student Clearinghouse only. If your school does not offer either of these services, your transcript must be sent by mail. Please note that use of these services does not expedite the processing of transcripts. If your school requires that you use a service other than Credential Solutions, Parchment, or National Student Clearinghouse, you should ask that service to mail the transcripts instead of sending them electronically. Since you cannot include the Transcript Request Form, you should include your full NursingCAS ID # when entering the NursingCAS mailing address. Click here to see if your school offers the Credentials Solutions service. If your school is not listed, your transcript must be sent by mail. If your school is listed, click here and follow the instructions to proceed. Once your transcript is requested, it takes 7-10 business days for it to post to your application. If your transcript is not posted after this timeframe, contact Credential Solutions directly to confirm the order was completed, then contact customer service. Click here to see if your school offers the Parchment service. If your school is not listed, your transcript must be sent by mail. If your school is listed, click here and follow the instructions to proceed. Once your transcript is requested, it takes 7-10 business days for it to post to your application. If your transcript is not posted after this timeframe, contact Parchment directly to confirm the order was completed, then contact customer service. From the menu bar, click Order–Track–Verify > Order or Track a Transcript. From the drop-down, select the school you wish to order a transcript from, then click Submit. When selecting the recipient, choose Educational organization. When entering recipient details, select NursingCAS from the drop-down, then enter the CAS Transcript ID. This ID is located below the barcode on the Transcript Request Form issued to you by NursingCAS (the barcode is located in the upper right corner of the form). Official Transcripts– You are required to have your official transcripts mailed directly to NursingCAS by the issuing institution’s registrar’s office for processing where they will be validated for authenticity by the operations team at NursingCAS. Each transcript will be provided to designated schools as a high-resolution PDF. These transcripts are considered official by AACRAO. Unofficial Transcripts– Your program does not require you to send any transcripts to NursingCAS. Instead please upload an unofficial version of your transcripts in either the Colleges Attended section or the Program Materials section under the Documents tab depending on what your school requires. No Transcripts– You are NOT required to have transcripts sent directly to NursingCAS. HOWEVER, your programs may still require transcripts sent directly to them. Check transcript requirements for each program with the institution if unsure. Full Transcript Entry with FULL Verification– You will enter in ALL of the coursework you have completed at any college or university attended in order to submit. NursingCAS will verify this data for accuracy, calculate the necessary GPAs, and send them to programs requiring Full Verification. Pre-requisite Transcript Entry with LIGHT Verification– You will ONLY enter specific courses you have completed to match your pre-requisite course requirements. These courses will not be verified and only Per Transcript and Overall GPAs will be provided to your program(s). No Transcript Entry with LIGHT Verification– You will NOT enter in any coursework data and only Per Transcript GPAs and an Overall GPA will be provided to your program(s). No Coursework Entry with No Verification– You will NOT enter in any coursework data and there will be no GPAs provided to your program(s). Please note that different programs may have different transcript requirements and require different levels of verification!